I recently got a new job, and to make things even better, my job is at a company who processes and places floors and walls in stone, mostly marble. 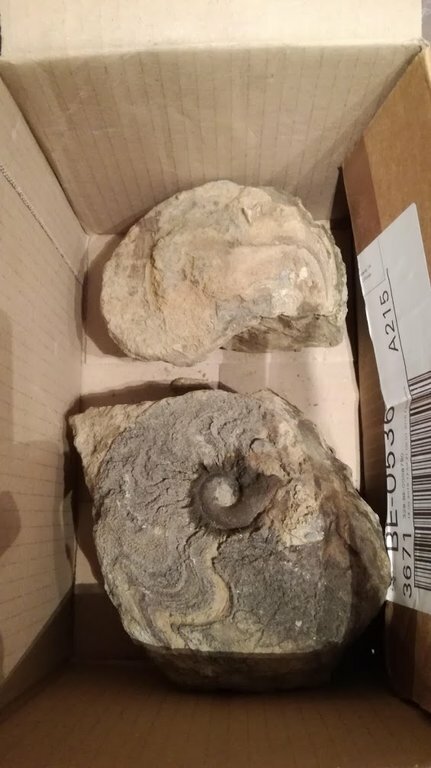 I took 2 of my Goniatites that weren't of top quality, or to hard to prep. 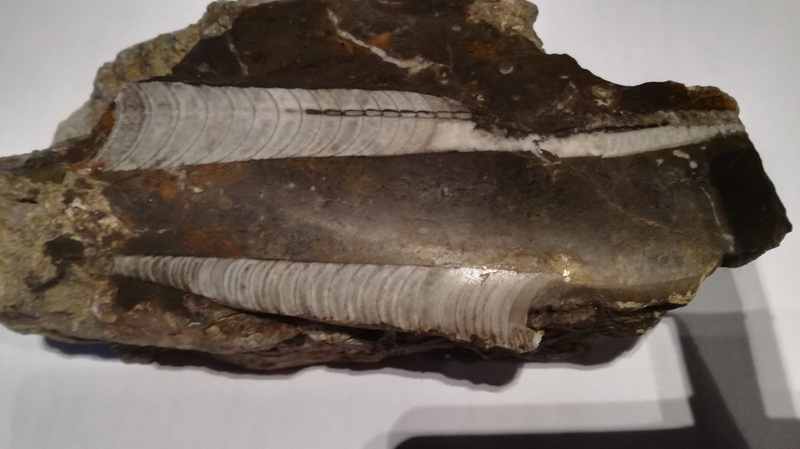 and today the helped me to cut the fossils and polish them. 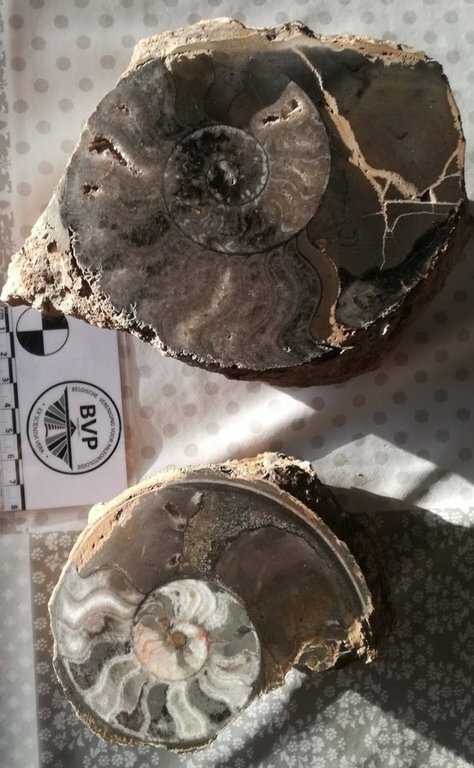 And a question for the moderators: the fossils have been cut and polished today, but were found earlier this year, are they valid entries for FOTM since al the cleaning , cutting and polishing was done now? Ah, polished goniatits! Very, very lovely! You did a great job and you have opened up a new "source" of fossil specimens: The discard piles! The staff will discuss this. Wonderful that You took a couple of garden rocks and ended up with nice display pieces! Congratulations on the successful experiment! Major fun times with your access to machines. Very nice! 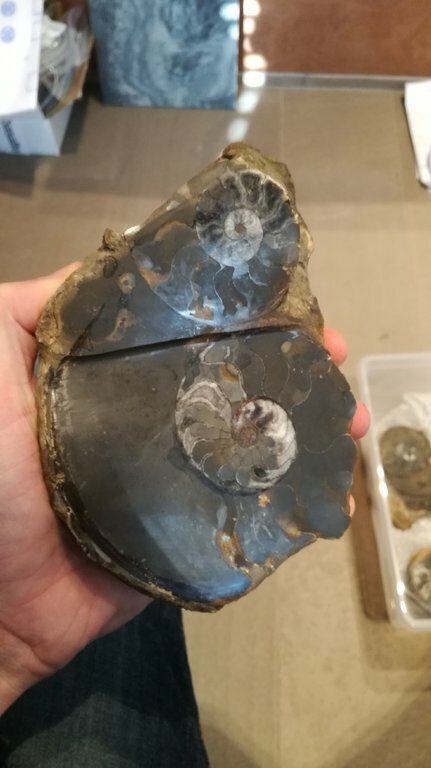 Your goniatites look great when cut and polished that way. They have been transformed into works of art! It's a perfect use of otherwise unpreppable discards. 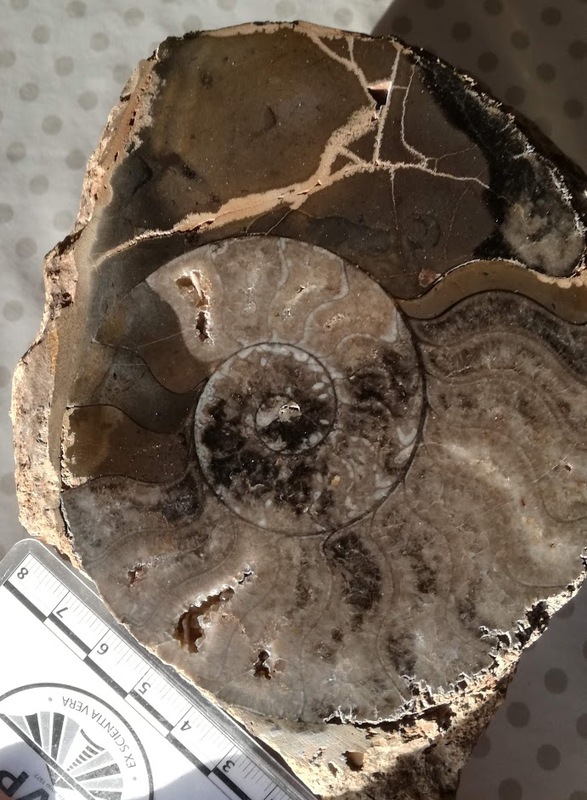 However, from the perspective of fossils as data for paleontology, sectioning and polishing does not add information that would enhance the scientific value of these specimens, for example by allowing them to be identified with greater certainty. On the other hand, sectioning and polishing corals reveals details of internal structure that are generally required for a confident ID, as well as commonly enhancing the appearance of the specimen. From the perspective of the FOTM contest, prepping should enhance the scientific value of the specimen by uncovering diagnostic features and by repairing (as in gluing back together) broken pieces. Of course a good prep job will also enhance the appearance of the specimen, and this will naturally influence how people vote for an entry. A great prepper has both sublime technical skill and an artist's eye. However, manipulation of a specimen in a way that improves its appearance at the expense of loss of detail or scientific value will not count as "preparation". 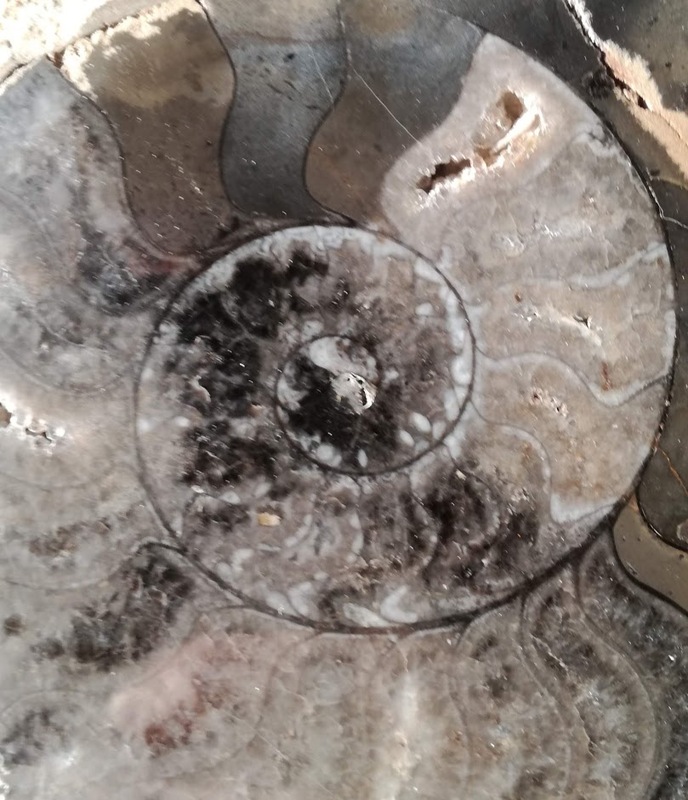 As an example, cutting/polishing pieces of agatized bone so they can be mounted in a pendant would not result in something that could be entered in the FOTM contest, although the result might be beautiful as jewelry. @Manticocerasman Nice results! It sure can be a relevation when you start cutting and polishing what would often just be rejects when seen from the outside. 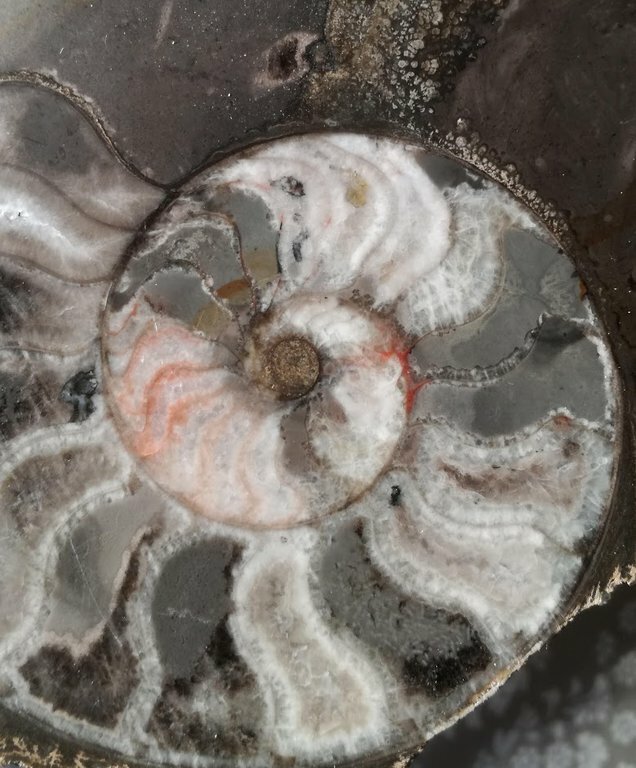 I started doing this quite a few years ago on the machine I used to use to cut and polish agates after I discovered that fossils can also have interesting internal mineral replacement structures. 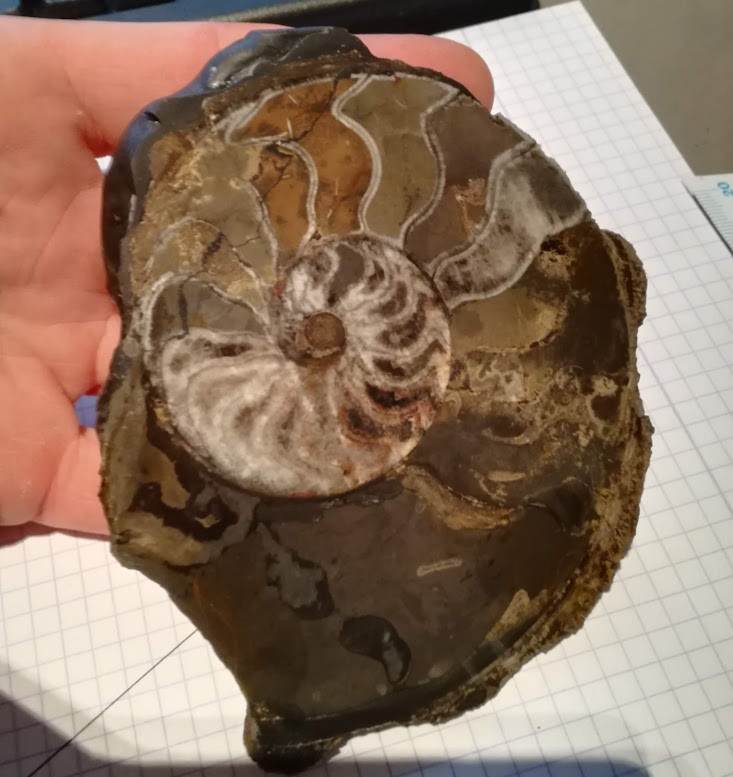 I did it mostly for the sake of the aesthetic quality of the "slices", as I call them, but it's also instructive viewing the internal structure of not only ammonoids, but also other fossils as well. Corals and sponges, for instance, often need to be cut in order to be properly identified. This is what I do with 10" slab saws in my basement. Cheap to buy and easy to use. Get yours today. Those came out purty dang nice! From what I would call 'lake skippers' to pieces of art. Nice job. 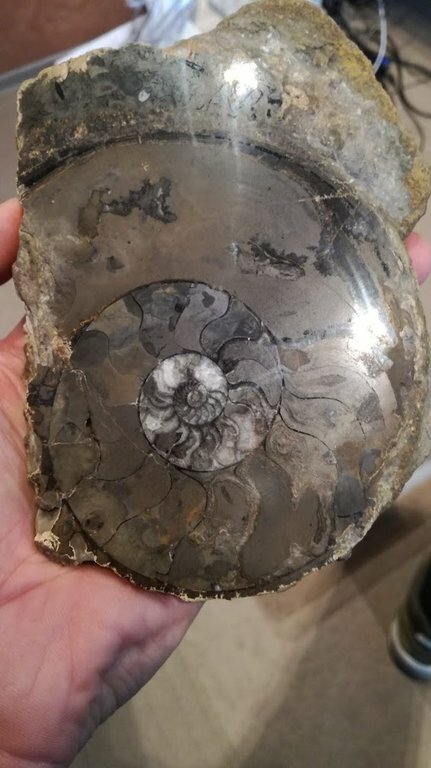 I do agree that the polished fossils should not enter the FOTM contest, but I have to disagree on the loss of sientific value on the specimens. 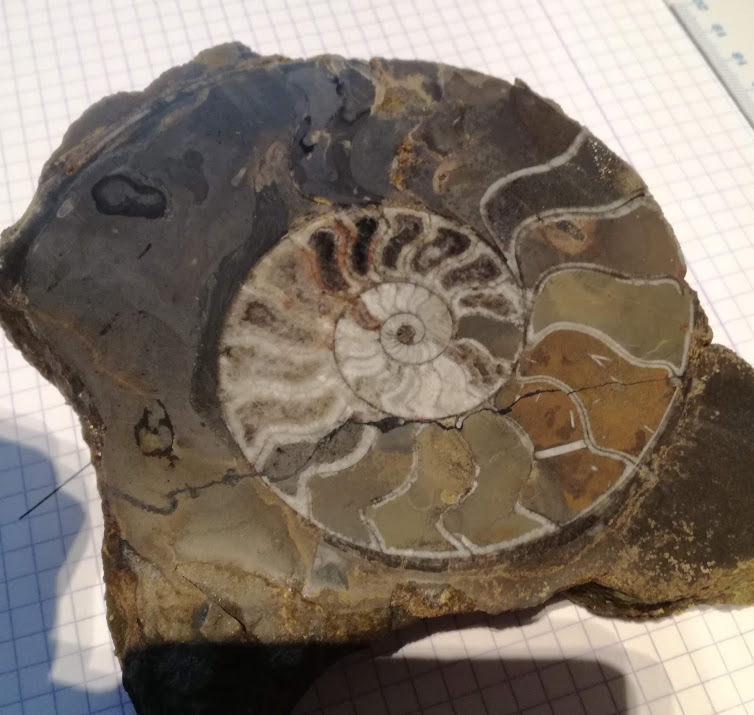 Especialy for paleozoic cephalopods: for the study and identification we often have to refer to destructive methods like cutting them to be able to identify the species of the fossil. For example Orthocone fossils are cut and polished to determine the shape and position of the siphuncle to make the determinations. 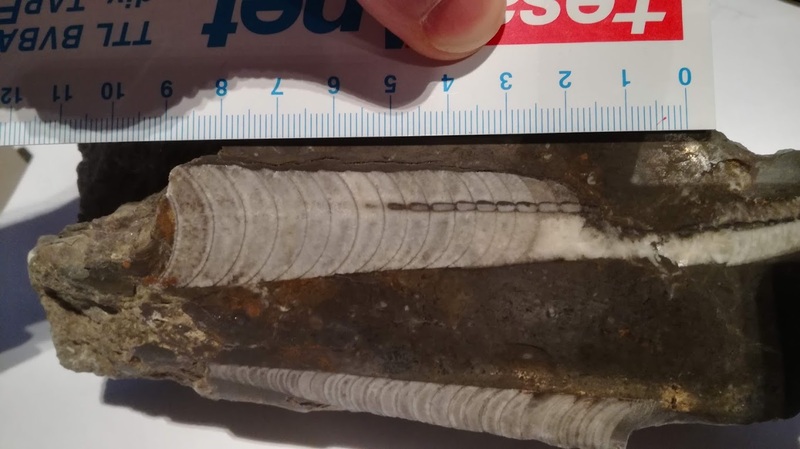 Kevin, we are looking more for preparation that reveals the original, external morphology of a specimen (with very rare exceptions) for the Contest. A new try. This time a double one. he turned out very wel, I got this one right in the middle. 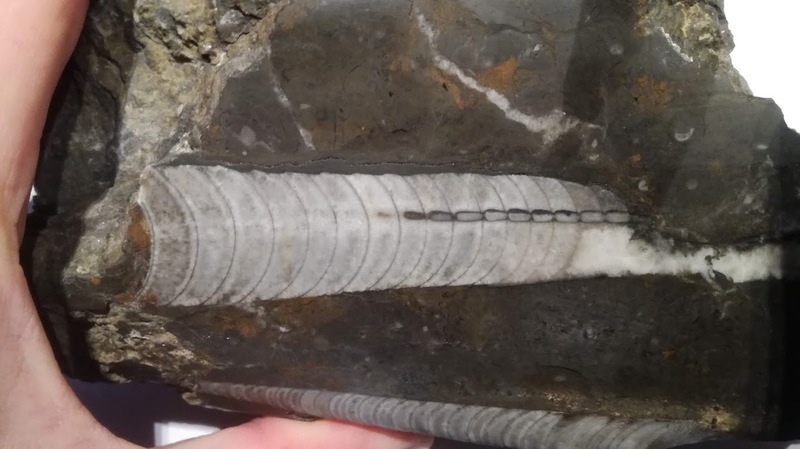 This time we used the tools on cutting and polishing a few rock containing 2 orthocones. On one of them got cut more or les on the syphuncle, so maybe I can get this specimen identified. 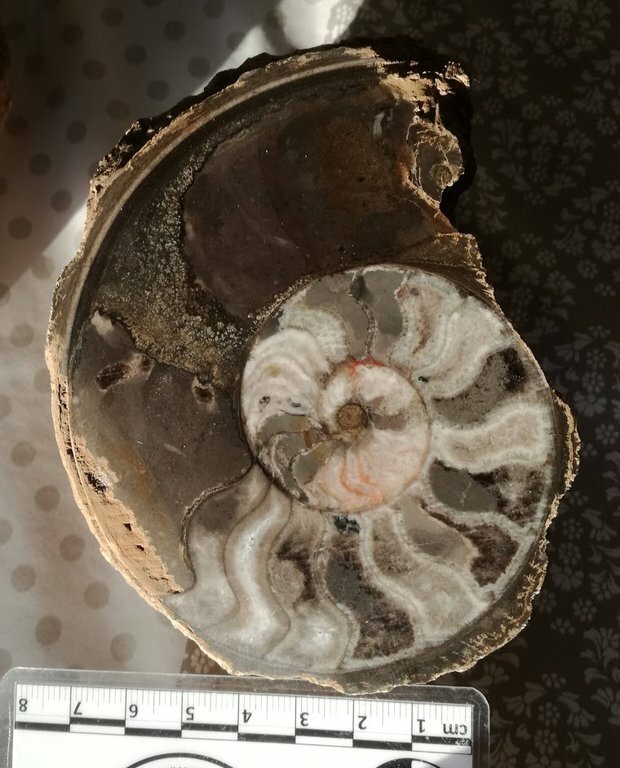 A new Manticoceras sp. that I pollished yesterday. They have a lovely colour variation in the chambers . The piece was then cut and both sides pollished.